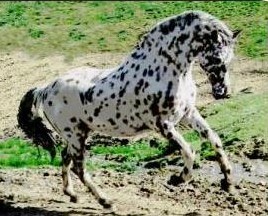 Clipper is a 1975, 16-hand, bay leopard stallion. He has never refused a request, and gives 110% in everything he has set out to do in his versatile career! Clipper is standing at Silvermoon Appaloosas, Foresthill, CA. Thankyou to his owners Gala Argent and Bob Schuster for allowing me to display this photo of their stunning stallion.